It’s all so West Ham, isn’t it? We are too obvious, too true to form, too predictable. Too often part of a painfully embarrassing soap opera that just delights everyone but us. If ‘you can‘t make it up‘ then it is certain to be about West Ham. Take these last two weeks--please take them, dump them somewhere, please--you don’t have to ask who the club is involved in these string of situations, it can only be us. Some of us old folk get to watch an afternoon quiz show called Pointless---no, shut up at the back, it’s not about us--when they ‘ask 100 people’ a question and you have to guess the most unlikely answer. The lowest points the better--no it is NOT about us. It runs a bit like this. Question: decide which team it is that beats a club below them in the relegation fight and everyone starts talking about Europe and a top eight finish, and then we go to a team even lower down the table and play like donkeys. Which club? Obviously West Ham. Next question: you sign nine new players at £100m, find three of them are badly injury-prone and have to sign someone in the window to fill the gaps. Who do you chose? Clearly a 31-year-old who hasn’t played for 18 months, is just getting over a drugs rap and wants £80,000 a week. Which club? Got to be West Ham United, surely. I will pause here for the collective laughter to die down from the length and breath of the country. We are the club that keeps on giving. OK... now we have a more touchy subject. There’s a hint of a problem with racism again (we’ve had one already this season) and at the very least some possible dalliance with right /far right politics. Now don’t forget we have just been voted the seventh most hated club in the country, and I am reliable informed by mates who support other clubs, that our supposed involvement with far right riff raff has a lot to do with it. So..next question: One of our number finds himself on a protest march with something called the Fat Lads Army--sorry lads, couldn’t resist, my hearing is not too good these days. Now I don’t know Mark Phillips. From what I read from his social media mates, he’s a lovely chap. I will protect his right to go on whatever march he likes and to have whatever political views he likes (as long as he doesn’t break the laws of assemble and hate speech that is). I sense I may not have much in common with his political views, but there you go, that’s democracy. We’re all West Ham. Problem is the club got a bit hot under the collar about it all. Now he was not suspended as the Tommy Robinson appreciation society amongst our fan base thinks, for being on the march or having views I may not agree with. He was suspended by the club because they have a social media code. Do I assume that he was using a club issue mobile phone, maybe not. Surely he realised that being associated with a group who many feel have Islamophobic, racist views--including the Premier League who have warned clubs about their activities--was asking for trouble? Anyway the issue become a cause célèbre, all sorts of outside factions having their say, and the club do it by the book regarding company law and find there is not enough evidence to take it further, and they reinstate him. Which club I ask my pals?…..it could only be West Ham, they smirk. I think I will leave it there, particularly because I am being informed that our Academy coach has an alleged nickname of Woolwich. I’ll get my coat. Mind you, it does throw up one nugget to mull over. Last season at this time we were at the height of the troubles and the club were searching round for fans’ groups, any groups, to work with them--to get them out of a hole. That included the esteemed editor of this website who gave up hours of his time to help--just as this site has done for over 20 years--only to now find himself banned by our juvenile media department for having a "negative" Twitter feed. Sadly sometimes you can make it up. 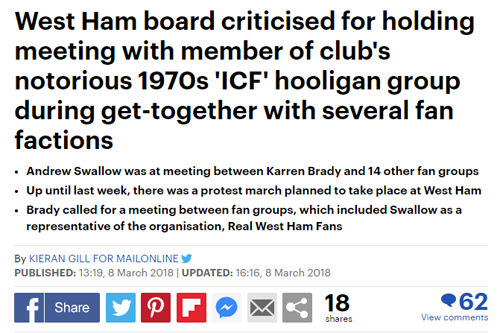 It was going so well until a couple of pesky newspapers came up with headlines suggesting: “Why are West Ham negotiating with hooligans? The boardroom’s collective scared knickers was a site to see, and there endeth collective bargaining. And it had been going so well. Andy Swallow did that YouTube interview and said the club couldn’t be seen to be negotiating with the ICF. Why would Andy make that up? Anyway, so the club won’t talk to the aforementioned likely lads, but we can have them on the pay roll. Sorry, that appeals to my warped sense of humour and I just hope Mark can get back to bringing on our youth talent, he doesn‘t need to be taking part in the Marching Season. Ok, back to real life. We have Arnie’s brother doing his usual pre-window nonsense (just ask Stoke fans), Pablo Zabaleta about to retire to his wife’s home city of Barcelona while Declan Rice is still wondering where the next square meal is coming from. Tough being a teenage millionaire. My hunch is that Arnie and his people are miffed that an overweight one-time French international is about to get £80,000 a week if he can train without injury (some hopes) or incident for a month while those lads currently doing the running around are struggling to make ends meet. I also reckon that when January comes around and a few bits of deadwood are shifted out, all these problems--yes I mean Declan--will be sorted. As long as Samir Nasri can get through a few weeks without falling out with the French media… to be fair, not easy considering they can be the most annoying, patronising, pompous bunch I have ever had the pleasure of working with. You’d have thought they invented the European Cup and the World Cup! OK, Nasri. There are pros and cons. He has been genuine world class, especially at Manchester City. Wonderful touch and vision. Truly from the next level and if he was fit and firing we would have no chance of getting him. He is no junkie. He was sanctioned by FIFA for having too high a level of minerals in a dose of intravenous fluid therapy, which speeds up muscle recovery and replenishes energy levels. Those upstanding morale sportsmen from athletes and cycling use it all the time, there are agreed levels of vitamins and minerals allowed, and Nasri’s private medical clinic in the States overstepped the mark. His first ban was six months but FIFA were so vigilant they increased that by a further year on appeal. That’s why he has done nothing but put on weight since leaving his Turkish club, Antalyaspor. The club that Anton Ferdinand played for a few years back, set on the beautiful Lycian Coast, Turkey’s Mediterranean coastline where yours truly has spend several holidays in the Kalkan region. Sorry, got carried away there. Now the cons. He has a reputation for being arrogant and hard work. City players were not to impressed with his attitude. Pep Guardiola reckoned he was lazy and tubby and banished him to train on his own. But, if he is now training for nothing with us and working towards proving he can still do it and also get match fit, then he is worth the gamble. Pelle has persuaded the board to give it a go. What can we lose? Without Manu Lanzini and any real midfield penetration and with Jack Wilshere not ready yet, Nasri could be a good bet. Right, last but not least, Huddersfield. A lovely day out with the lad ruined by a football team who lost the plot. I predicted that Huddersfield would concentrate on Felipe Anderson and Grady Diangana, such was their excellence the previous week. Huddersfield are all high pressing and work rate. They don’t call David Wagner ’little Klopp’ for nothing. Friends and former colleagues in Germany say they play the same way. Wenger had worked out that Lukasz Fabianski’s roll outs almost always go through Issa Diop, who was pressured on the edge of his box ever time, hence the panic that seemed to set in all around him. Pelle’s one telling remark afterwards was that the team had ignored or forgotten what they team had worked on all week. Assumedly how to negate the press. That worries me more than anything else, that our players are not capable of carrying out planned instructions. Huddersfield went for our two wide men with a vengeance, pressure, no space. Diangana started well and created a great chance for Arnie, but slowly he was crowded out of the game. He has a lot to learn and his half-time hook was inevitable. Now I have said already I rate Anderson. We can see his deficiencies, he doesn’t like a tackle and being hounded. But he is working hard to learn and adapt his game. He never hid, despite a battering from the high press game. In the end he had the final say. I have seen folk claim he cannot glide past three or four players. Well that equaliser started out on the left with him doing just that, plus a nutmeg. He created that goal and was on hand to finish superbly when everyone else had fluffed it. Me and the lad had to listen to constant abuse for Anderson by couple of muppets behind us. When he scored they left, no doubt angry their views had be proved wrong. It was frustrating and worrying in the end, but a point all the same. And guess what. Big Andy is back, so everything will be fine when Manchester City come to town next week.